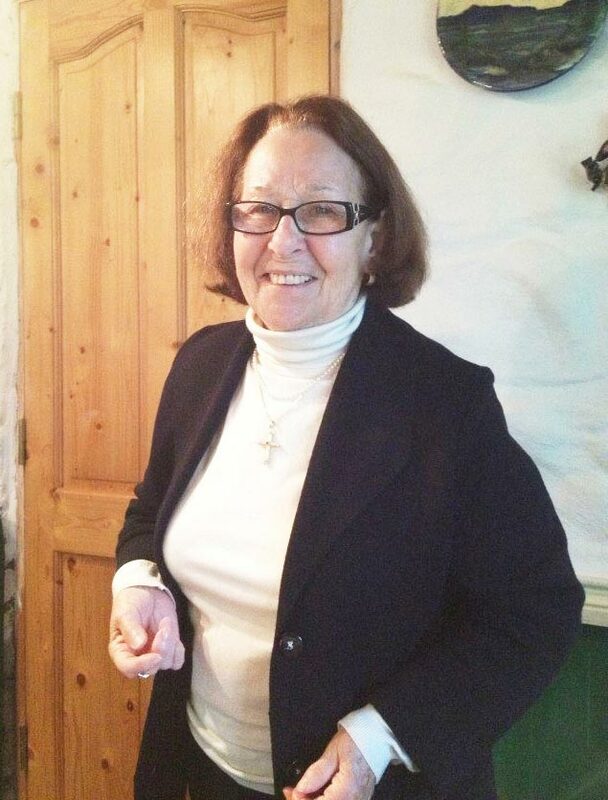 Vanda will be remembered for her playful spirit, warm embraces, and Italian aphorisms such as “La vita è già amara” (“Life is already bitter”) when asked if she wanted sugar in her coffee and “Ci fai, o ci sei” (roughly translated, “Can you really be that ignorant?”) when angered by blustering politicians. Vanda would have been the first to admit that after spending more than two-thirds of her life in the U.S., she could hold her own in the English language but managed at best a tenuous hold on the American accent. Her mispronunciations and malapropisms were legend: “clutch” for crotch, “forket” for fork, and “strimp” for shrimp. Vanda was born in Rome in 1932 to Arnaldo Fanelli, a trucking company owner, and his wife, the former Norina Prosperi. During World War II, Vanda’s parents sent her to a convent school near their home village of Polverina, in the region of Le Marche east of the capital. There, she discovered a passion for fresh peaches, hid less appetizing comestibles in her pockets for disposal after mealtime, and developed an expertise in disobeying nuns. Vanda recalled postwar Rome, where she spent her teen years, as a mecca of mischief and misadventure. When her mother gave her money to take the streetcar to school, she and her friends walked and saved their lire for fresh doughnuts instead. Later, she would sneak out to the tea rooms on Via Veneto for afternoon dancing — something her mother would have found scandalous. She frequently avoided dishwashing duty by claiming that she didn’t know how. “Why don’t you show me, and then I’ll learn,” she told her sister Adriana countless times. In 1953, a group of American medical students moved into the apartment below Vanda’s family home on Corso Trieste. After spotting the mysterious strangers on the balcony, Vanda wanted nothing more than to shout down to them but was uncharacteristically shy. One afternoon when she had the good fortune to encounter them in the elevator, she plucked up the courage to invite the Americans to a party. Among them was Joseph Lucas, a good-looking and bespectacled graduate of Villanova University who had grown up in Schenectady, N.Y. The two took a liking to each other, but Joe, always cautious, quickly announced that he wasn’t interested in getting married. Vanda responded, “Don’t worry. I’m just looking for a boy to take me out and have fun.” Have fun they did, zipping around Rome on Joe’s Vespa scooter and frequenting a pizzeria on Sant’Ignazio Square. Two years after they met, they exchanged vows in the third chapel on the left in St. Peter’s Basilica. It was 7 am on Monday, Nov. 14, 1955. Vanda wore a black suit and fainted. In 1957, as Joe was wrapping up his medical degree, he dispatched his bride to Schenectady to live with his mother for a few months. For the adventurous young Romana, the experience was nothing like the slow wade into American culture she had hoped for; it was a plunge, and it was bracing, leaving Vanda to wonder what exactly she had gotten herself into. Upon Joe’s arrival back in New York, he was offered an internship at a local hospital and the newlyweds moved out of his family home. Joe completed his residency at the University of Nebraska in Omaha, where the couple’s first daughter, Elizabeth, was born, in 1959. In 1961, the new family moved to West Hartford, Conn., where daughters Monique and Jacqueline were born. When she wasn’t impeccably dressing her children, imbuing them with the confidence and wisdom that were her hallmark, or traveling to Italy to see her sisters, brother, and parents, Vanda served as manager of Joe’s growing medical practice. There, she helped her husband care for many of the Italian and Portuguese families of Hartford’s West Side. Seeking a calm, quiet place for retirement, Vanda and Joe began visiting the Vineyard in the late 1980s. After falling in love with the wooded lanes and wide beaches, they bought their home on Tea Lane in 1990 and moved there full-time in 1998. When Joe fell ill with Parkinson’s disease a decade ago, Vanda took the lead in caring for him, devoting her life for several years solely to keeping him healthy. When Joe died in 2006, Vanda’s big heart suffered the first of its two deepest scars, but she grew to embrace her solitude on Tea Lane, spending long nights reading about politics, history, and England’s monarchs. She ultimately rebuilt her life around her children and grandchildren, showering them with laughter, love, and life lessons. “When you are visiting Italy, enjoy looking at the boys, but don’t listen to anything they say,” she cautioned the girls. She would instruct her children to give the grandchildren two kisses. “I will give them back to you when I see you,” she said. In 2011, Vanda suffered another heartbreak when her youngest daughter, Jacqueline, died of pancreatic cancer. This year, Vanda had just begun to recover from that blow, taking two trips to Italy to see her family and revisit the haunts of her youth, including the pizzeria at Sant’Ignazio she and Joe loved. Her generous heart kept beating until two hours into her wedding anniversary. In Rome, it was almost exactly the time she and Joe had exchanged vows 58 years earlier. Her surviving children surmise that Joe, who always bought her a rose for each year to celebrate their union, greeted her with 58 stems. A memorial service for Vanda will be held on Nov. 30 at Our Lady Star of the Sea in Oak Bluffs. Vanda is survived by her sister, Franca Zolla, of Rome; daughters Elizabeth Randall of Chilmark and Monique Conroy of Easthampton; granddaughters Kristina Conroy of Middlebury, Vt., and Esmé and Adriana Rocks of Berlin, Germany; grandsons Andrew Randall of Chilmark and Kevin Conroy of Middlebury; sons-in-law Mark Conroy of Easthampton and David Rocks of Berlin; and her beloved black-and-white cat, Rowena.